Crazy knitter and vegan to boot! I love this time of the year for so many reasons. Supplies are on sale because of back to school. Fall is just around the corner. It’s the start of the busiest time in my shop. I love supplies especially writing with different coloured pens as you can see. I always carry a notebook with me so I can write my ideas down on the spot. Sometimes it’s an idea for a blog post but mostly they’re knitting ideas. 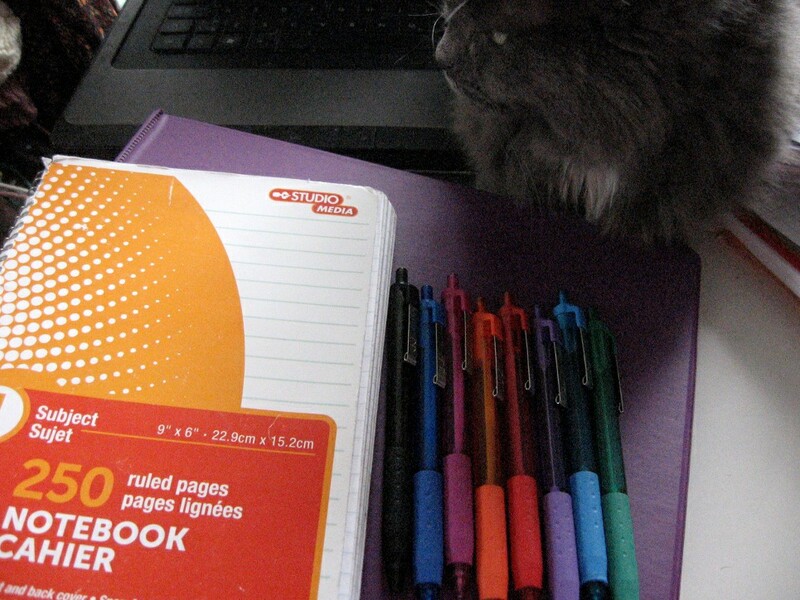 I use the purple binder to keep my blogging ideas together. And my laptop! Well, my laptop is what makes this writing possible. It’s what makes selling on Etsy possible! Balou always has to be close to the laptop when I work. I love fall with the orange,red and brown leaves. Temperatures start to go down and people really do prefer buying scarves and slouchy hats when it gets cooler. Summer is the time I knit a lot of my stock and create new items. The humidity and heat we had this entire summer made knitting quite a task. The yarn was often sticking in my hands! I swear I will get an air conditioner for next summer!